A few months ago, I began a search for a local farm that I could photograph as part of a project to help re-acquaint the general public with the importance of our local farms. 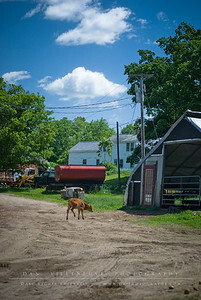 Coming from a town where my family farm was the second to last to go extinct back in 1996 (Clark's Farm was the last truly active farm until they closed a few years ago), I am amazed at how many active farms there are in the central Connecticut area. One farm in particular, was brought to my attention. 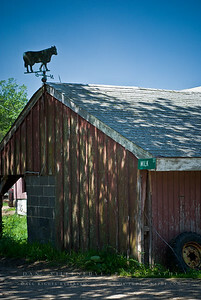 Rock Maple Farm, located in Eastford, CT, is run by a wonderful couple, Suzanne and Ken Buell, and their family. This gallery is a small window that allows you to gaze into a part of their daily work environment. 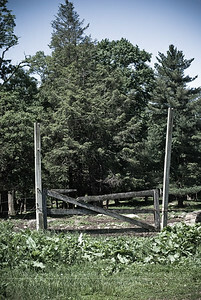 To learn more about my experience at Rock Maple Farm and this project, click here to view my Blog entry. 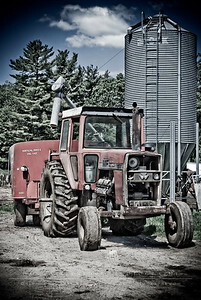 As part of this project, I will be selling signed, matted prints at the Coventry Regional Farmers' Market as part of their Sunday, July 17th "Graze Fest" event. I am also co-sponsoring this event as a show of support for all of our local farming community. 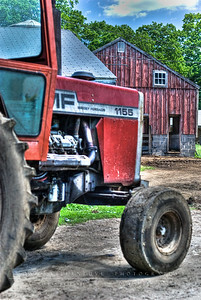 50% of all proceeds from the sale of these prints will be donated back to the Rock Maple Farm! I invite each of you to help join this project and become better educated on the benefits of supporting our local farms! 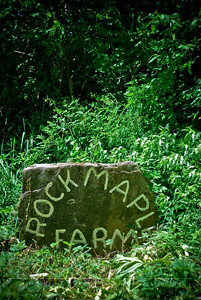 Welcome to Rock Maple Farm! This etched stone greets you upon arriving. 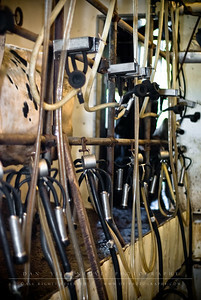 The milking room. Every day, cows are brought into this room to be milked. Unlike the old days of manual milking, the Buell's make use of time saving equipment. 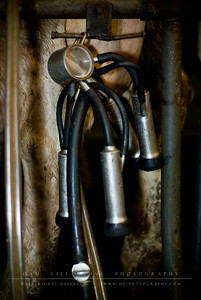 A closer look at the milking machine's utter attachments. 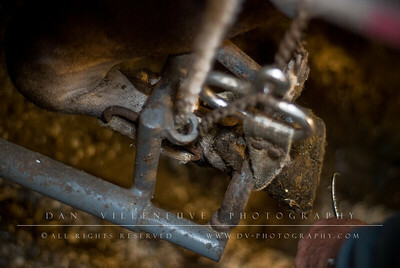 Suzanne is seen here sterilizing the cow's utters before attaching it to the milking machine. 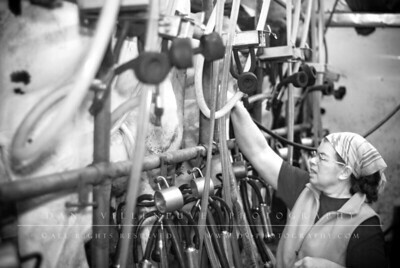 Suzanne is seen here monitoring the milking process. 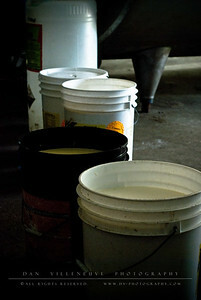 Raw milk collected from the cows are temporarily put in buckets before they go through a pasteurization process. 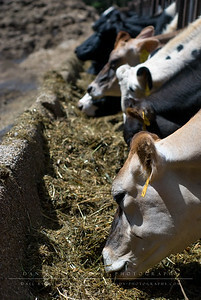 The pasteurized milk then goes in a holding tank before it is collected by an 18-wheel container truck. 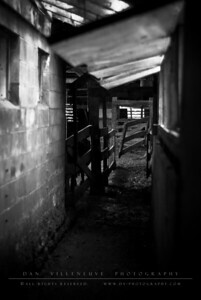 This is the hallway the cows move down to get back to the main barn after being milked or having their hooves trimmed/treated. 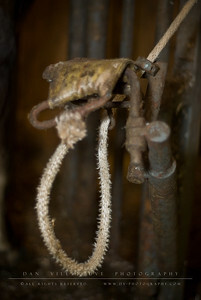 Ken fashioned this sling to comfortably support the cow's hoof during the trimming and treatment process. Farmers are very inventive folk and Ken is no exception! Here Ken is rough trimming a hoof. 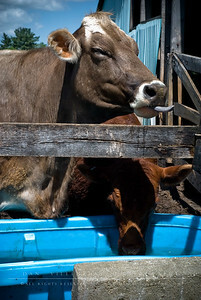 Frequent trimming and shaping of hooves help keep the cows healthy by preventing overgrowth and infection. This is a view of Ken's sling in action. 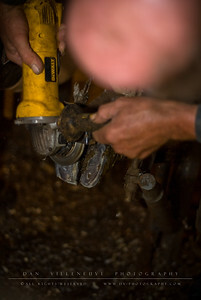 He is using a trimming knife to rough out the edges of the hoof. Much like a car tire's tread pushes water out to the side for better traction, farmers shape a groove in the hoof to help push mud out and away from the center. This also helps minimize infection. 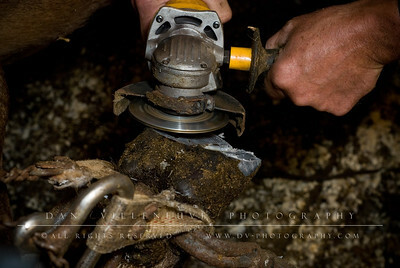 To keep the hoof even, Ken uses a grinder to shave down overgrowth. 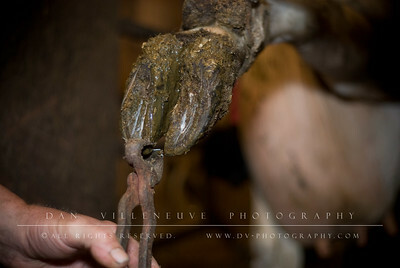 While this may seem like it could be painful, shaving a cow's hoof is very similar to trimming your own fingernails and does not hurt the cow. 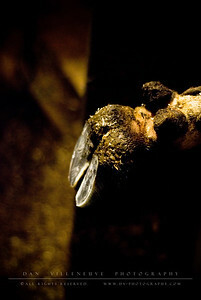 Here's a different view of Ken evening out this cow's hoof. And the results of a successful trim! 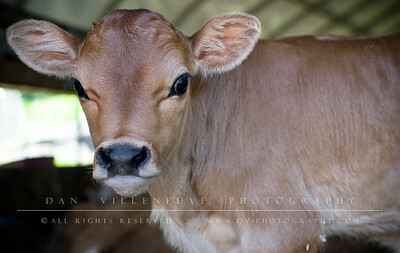 This little calf was exploring when I came out of the milking room. It was heading back to the shelter where the other calves were, to the right of the image. 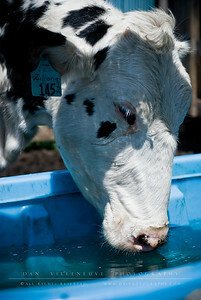 Every morning, Suzanne spends time feeding each of the calves. 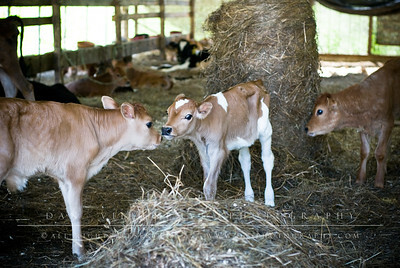 These little ones are still too young for hay or grain and need to be bottle fed. 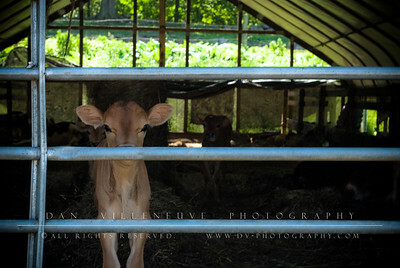 This little Jersey calf was wondering what I was up to, or perhaps if I had any food. Here's a view of the same Jersey calf without the gate. 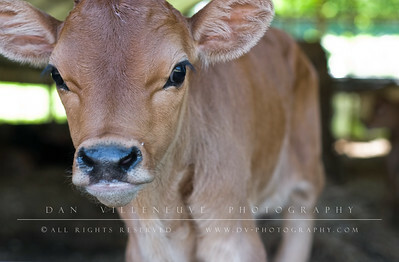 Here's a view of the same Jersey calf without the gate. It kept turning around to make sure I was still there. These two calves greeted each other in a seemingly caring way. 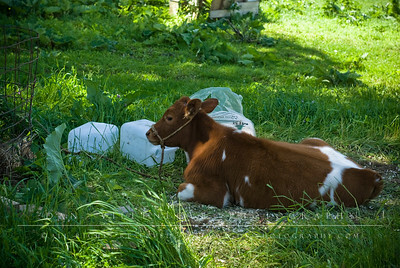 This calf was enjoying the shade. 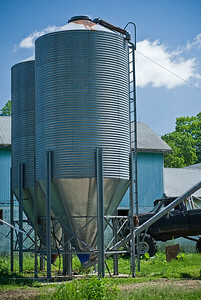 A view of the grain hoppers/silos. The workers in charge of feeding the cows bring a trailer along side and load up with grain to be dispensed at the feeding areas. 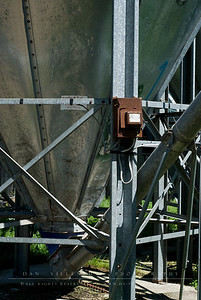 A closer look at the bottom of the grain silo. 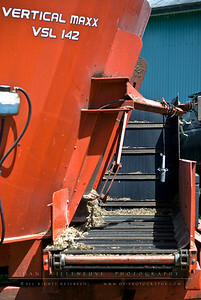 This conveyor belt at the bottom of the grain trailer helps move the grain from the trailer to the feeding trough. 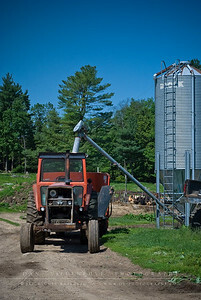 A view of the tractor parked under the hopper. 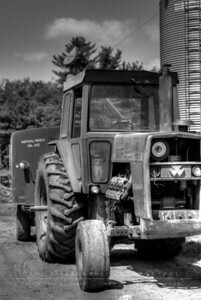 Another view of the tractor parked under the hopper. 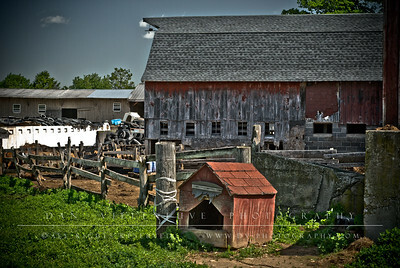 Even the family dogs have their own shelter next to the hay barn. 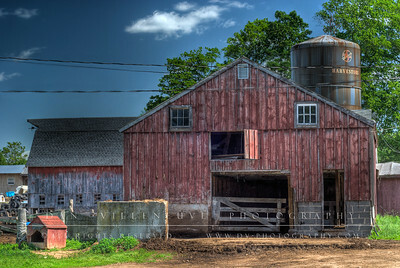 This is a High Dynamic Range (HDR) capture of one of the barns. This particular barn is storage for baled hay as well as extra shelter for the over 300 head of dairy cattle. 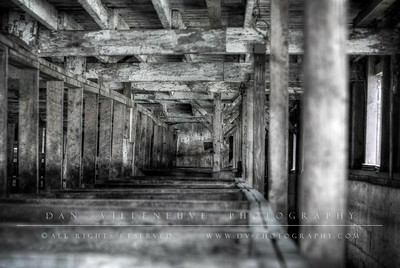 This is a High Dynamic Range (HDR) image of the individual stalls where cows are kept. This reminds me a lot of the inside of my family's barn in NH. 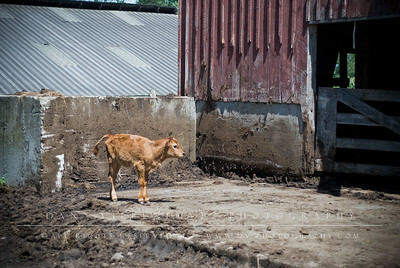 This little calf was having fun exploring the entrance to the hay barn. 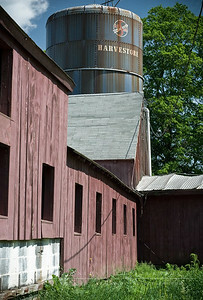 The side of the hay barn with a silo in the background. 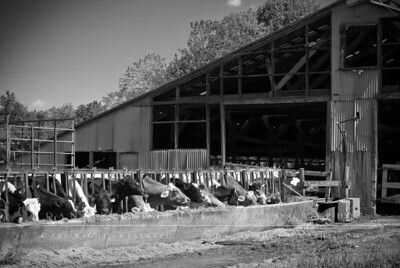 Feeding time This is a side view of the main barn and one of the larger feeding areas. Another view of the same feeding area. 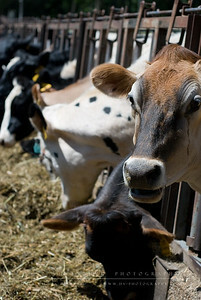 Each cow has identification tags on its ears. 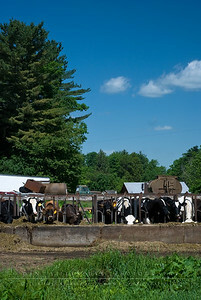 These tags provide essential information about the cow for quick reference. This cow kept casually looking up at me as if to say, "What are you looking at? Haven't you ever seen a cow eat before?" Mid-morning breakfast... or is it pre-brunch?